However you look at it, it seems unfeasible. 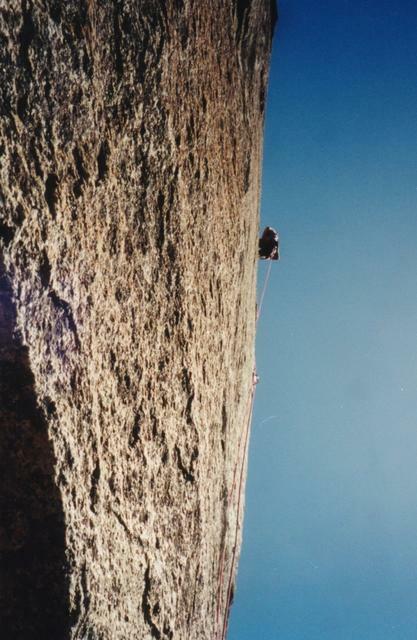 A man standing thousands of feet up above you on an apparently blank rock face. There is no doubt about it, somehow that somebody got to be standing up there on something. He appears to be alive. For us mere mortals the idea of attempting such an ascent conjures frightful images of slips, flailing hands, fatal falls ... an unwelcoming abyss. Of course, from where we are standing, we can not see that in fact the blank wall is full of potential holds, resting places. We can barely see the rope, the protection bolts. We can not see the years of training, the monomania of the climber. We are surely unaware that he has made choices, sacrifices to get to where he is standing. We imagine ourselves in his place, we don't see his route. If you want to feel failure constantly, compare yourself to people with incomparable talents, resources, experience. In fact, just forget yourself completely, forget your value is no less or no more, however high you get, than anyone else. Go on exhaust yourself trying to take 14 steps at a time. I have been blog-hopping in #ccourses and I have been reflecting. It was Paul Signorelli who sparked this post when he used the word blog hopping, I liked that word. I was strangely struck by a memory of bounding up crags boulder by boulder. Tracing such a path, that is easy to imagine. It is a recurrent embodied image for me. I am never sure where my momentum comes from. Is it me, the boulder, the slope, the joy of jumping? The risks are not great, the rewards are immense. I fell upon this video of 'crag-hopping' in the Lake District. I could identify with that. As I watched it, there was something about it which evoked how I am making my path online/offline connecting courses, connecting with people, ideas, images. As I read blogs, tweets, look at images, read comments, there are people who support me, who make me stop and think, there are resting places, there are stable boulders on which I can get real purchase. Sometimes I can envisage great leaps (for me). Blogs have been like a boulder field for me over the years. As, I have climbed higher and higher, learning has often been unconscious. I enjoy the dynamic, I leap around for the hell of it. If I look back I can't quite work out how I got to be standing where I am now. I have forgotten the little pebbles, the stumbles, the dead ends. I remember some people... Stephen Downes, Steve Wheeler, Graham Attwell, they guided me consciously or unconsiously, they were landmarks for me. They are still there, remembered, embodied or part of my peripheral vision. I am reminded of Dave Cormier and his thoughts on learning in communities in edtech talks, on rhizomatic learning, of #rhizo14. As I climb, I see fellow climbers appear to be grouping in the same places, the same hostels. As I climb, I realise I am not alone in this wasteland. I clearly feel part of a wider community of fellow travellers. As I pass people on the fells, I am greeted with "Hi, how are you doing?" There are people who give us courage, when the going is tough. They are others who always seem unperturbed by being in an eery place. They always come up with a laugh, a kind word, when you are shaking on the edge. They themselves are shaking on the edge but their laughter dissimilates the fear. I think of Howard Rheingold, Alan Levine, Jim Groom and their larking around in Blog talks. Poets, stargazers, guides and storytellers. We need poets,stargazers guides and storytellers who can enable us to appreciate beauty and warn us of dangers to come. I suddenly think of Gardner Campbell. I think back to a conference, Ecologies of Yearning,I watched so long, it seems, ago. I suddenly think of Catherin Cronin, I think back to a conference I watched so long, it seems, ago. I suddenly think of John Udell, Gardner Campbell, and Howard Rheingold, I think back to a hangout I watched so long, it seems ago. I suddenly think of Alec Couros and his happy band of ETMOOCers. I think back to that hangout I saw last night. I realise that I can stumble on. I remember the importance of fun. That is what keeps me bounding on despite the horrific drop beyond. There are times when it all just seems futile. There are times when it just rains, your visibility is zero and you have blistered feet. I was feeling like that... yesterday was it? I am mapping this path, it's a trail that marks my way. I have no idea if it will be seen, read, understood, or appreciated, but who cares? I stop here a while to take in the view. I am posing this pebble with a handful of others on a pile of rocks. It is a cairn called Connected Courses. It might become a place for travellers to rest, it might be seen from afar from years from now. This little pebble might be picked up and pocketed by someone to remind them of their journey. Take it, it is yours. Wonderful. And you have added to our Connected Courses/co-learning vocabulary with "getting blogged down" while showing us that you are not at all suffering from that affliction. We may need a connectivist MOOC glossary--a "MOOCary"?--if we keep this game going at this level. Maha, any contributions to the language of MOOC? Don't get me going on MOOCs. Can someone kill the f***ing MOOCing bird? X marks the spot. What a lovely Crystal covered pebble this is, a metaphor to hold on to. Thanks Simon. Some of us have found caves with ossuaries. Fascinating. Quiet. Solitary. Looking forward to meeting u there when u get fed up of solitary quiet :-) Gradually emerging. You know, we used to play with pebbles when we were kids. And then we forgot to. We thought that piling up the cairn as a group activity wasn't meaningful because after all how can you get a job doing that? Nobody's going to get a job doing that. I can hear many of your lovely poetic phrases as music. Thank you, I will take a pebble. Resting now and surveying the field. Love the idea of a glossary of created words/terms. "I am mapping this path, it's a trail that marks my way."